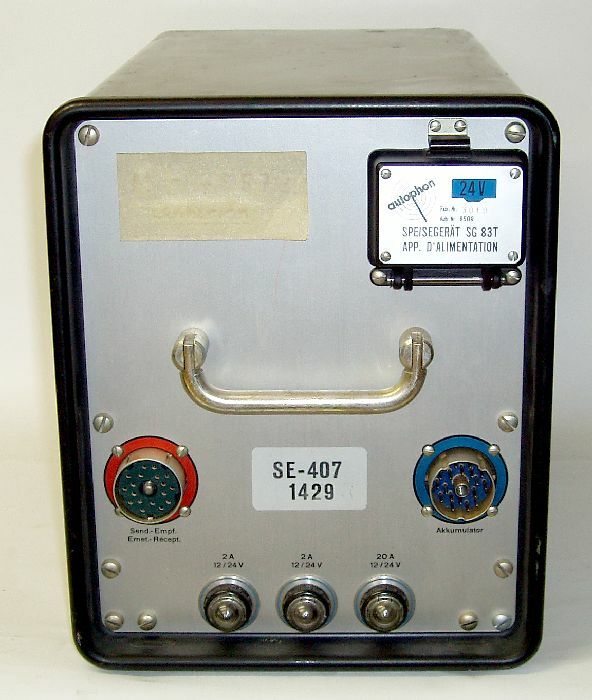 The new station SE-407/411 came in service in 1957, until 1963, around 1300 sets have been acquired. 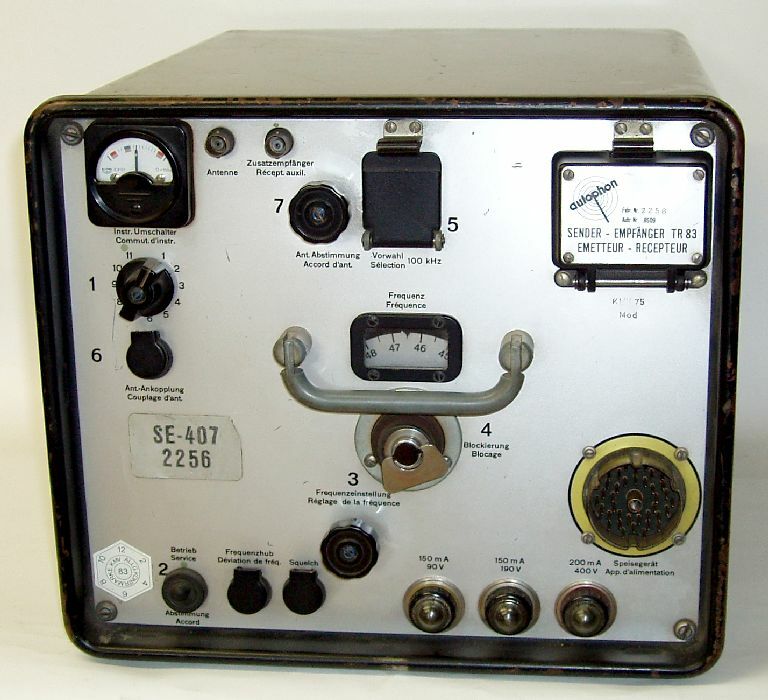 It was not before the end of the seventies, when the system has been replaced by the SE-412 transceiver, based on the American AN/VRC-12. The wireless set can be tuned to twelve frequency channels, mechanically stored and pre-tuned, in the 24,1 - 35 MHz range. 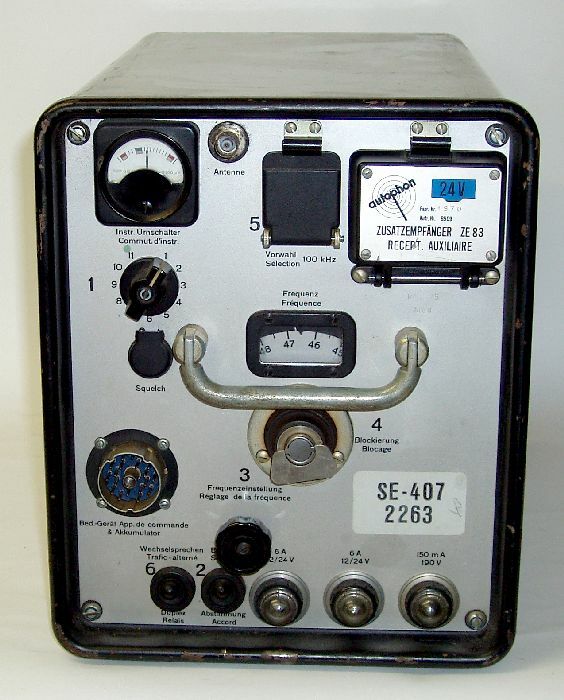 The set consists of a transceiver TR-96, a separate auxiliary receiver ZE-96 (intended to be used to catch the orders from the superior command) and a power supply. 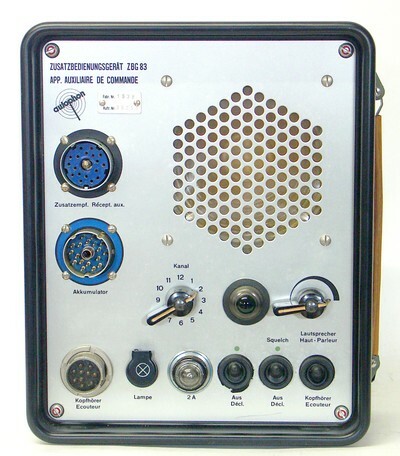 The SE-411 communications equipment has been installed on the command vehicle Mowag. Tha transceiver TR 96 is mounted at the left in the mounting frame, it's dimensions are 302 x 260 x 340 mm and it's weight 23,2 kg. 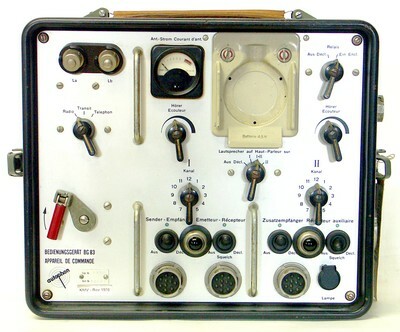 In the transmitter section of the modular construction, the signal of the common oscillator operating in the 24,1 - 35 MHz range is fed through an amplifier and exciter stage to the two final valves in a push-pull arrrangement, the antenna is fed through a variable coupler and antenna tuner. The power supply generates all necessary voltages for the transceiver and the auxiliary receiver and other modules from the 12 or 24 V DC vehicular power system. The correct voltage must be switched on the power supply, on the auxiliary receiver and with two switched on the mounting frame. The auxiliary receiver ZE 96 is technically identical to the receiver section of the TR 96, the cabinet is a bit smaller with 212 x 260 x 340 mm and "only" 21,1 kg. 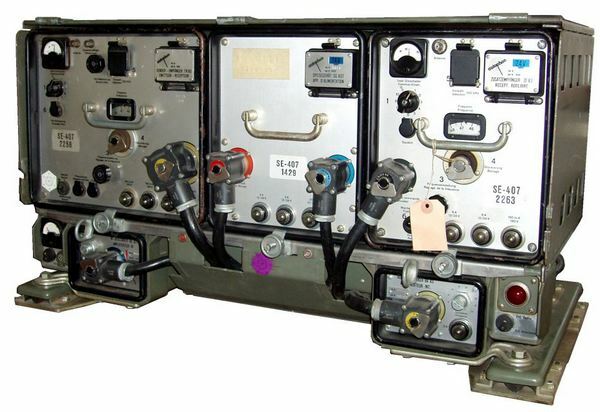 The auxiliary receiver permits to catch orders from a superior command on one frequency while communicating with other troops (e.g. other platoons) on another frequency. 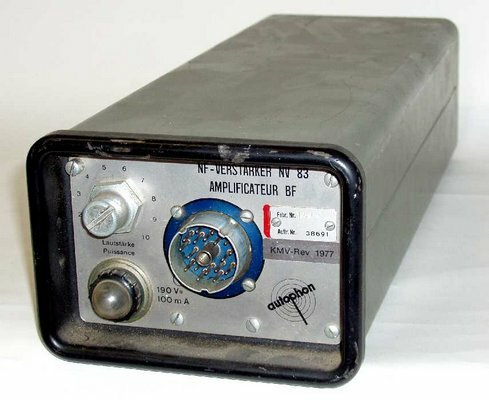 To use the auxiliary receiver as "standalone" set, You need the auxiliary control set / "Zusatzbediengerät"; so the value of a single auxiliary receiver sold as military surplus is reduced by far. 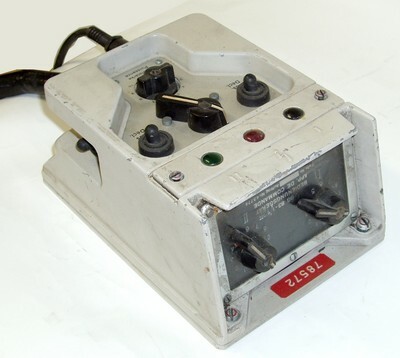 The pre-programmed channels can be recalled from a control set installed at the tank commander's seat, You ca nalso select whether You want to hear the signal of the main or the auxiliary receiver or the on-board intercom on the headphones. From a remote control set, the station can be controlled over field telephone lines. 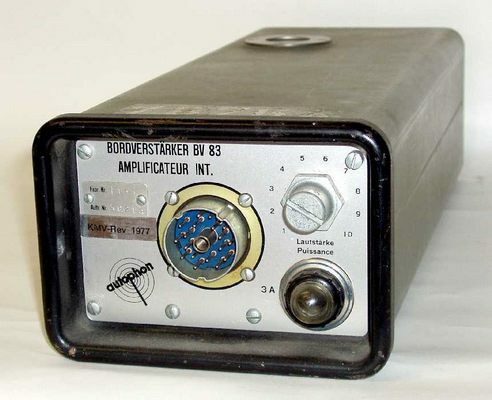 There is a big number of other acessories: an external speaker LS 83, thy typical Swiss Army microtel (like a telephone handset), a headgear with headphones and throat microphone to be used in noisy surroundings and various antenna equipment.